I know I am suppose to be working hard on my office & craft room for the $100 Room Challenge, but I like to jump around the house redoing things here and there. It drives my husband bonkers! But when the inspiration strikes, I need to jump in and get things done. 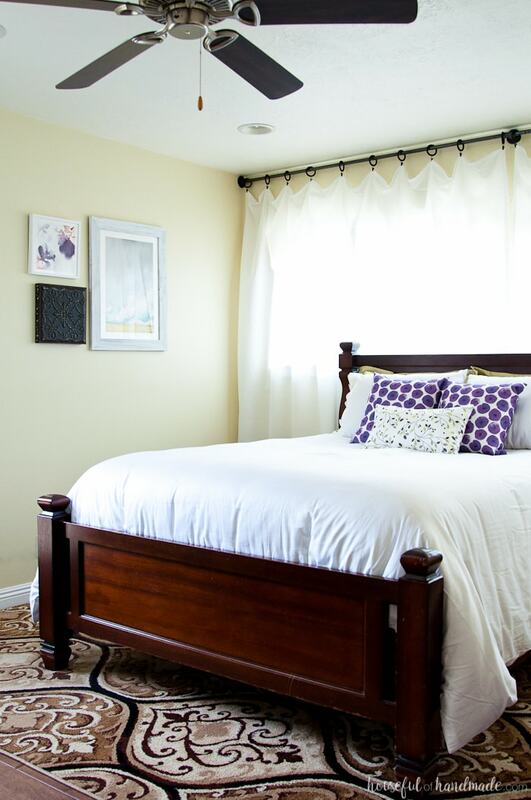 And if you are following me on Instagram, you may have noticed that this little Master Bedroom Makeover actually started in January when I decided on a whim to rearrange the furniture. After that, I have been itching to finally accomplish all the little things to really make my bedroom shine! 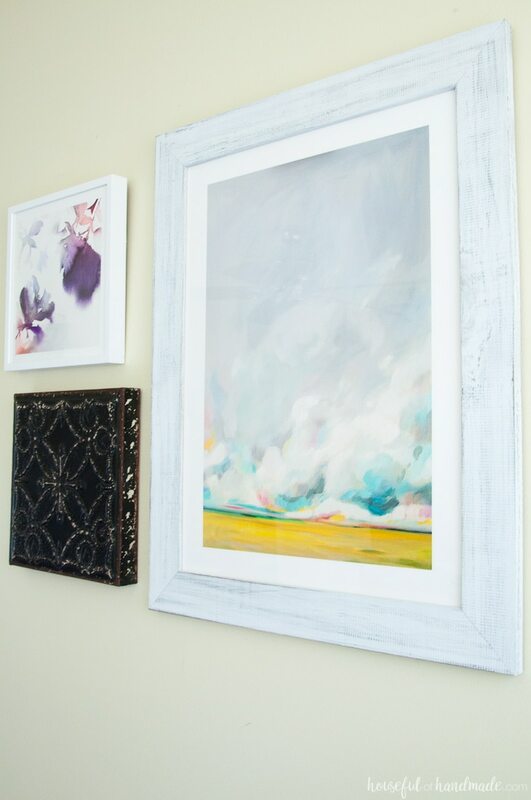 This post was sponsored by Minted.com, however, all opinions and reviews are 100% honest. Click here to read my full disclosure policy. 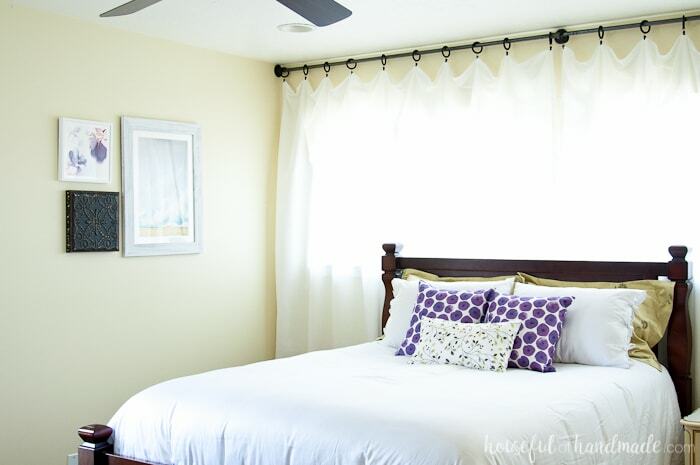 During life before kids, I thought I would make a perfect master bedroom. I found some luxe silk curtains that I fell in love with. Painted the room, and we moved in. Fast forward many years later… the room is the exact same. I still love the curtains, but they are too short for the room, they make the room look smaller. They also block a lot of light (which is actually great on Saturday mornings, but otherwise I hate it). Also, I have really wanted to add another color to our bedroom. I painted the walls a soft sage to match the sage curtains. Then added some white linens. And that was it. No other color to add any contrast to the space. I felt like we were lacking depth. Finally, there was a severe lack of art on the wall! Can you believe we have lived in this room for 10 years and the only thing I had managed to hang on the walls was the poem my husband wrote when he proposed. Totally sweet I know, but doesn’t fill the large blank walls. 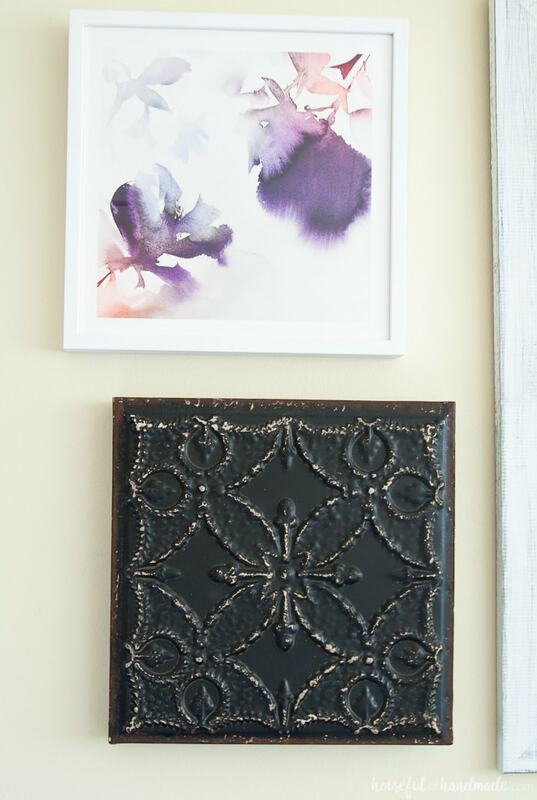 So when I discovered Minted.com, I knew it was the perfect time to tackle a Master Bedroom makeover. To finally address all these little things that have been bugging me, I took a break from the fun in my office & craft room and spent the weekend refreshing the space. I have to admit I am so glad I finally did because now I have the perfect Master Bedroom to escape to. 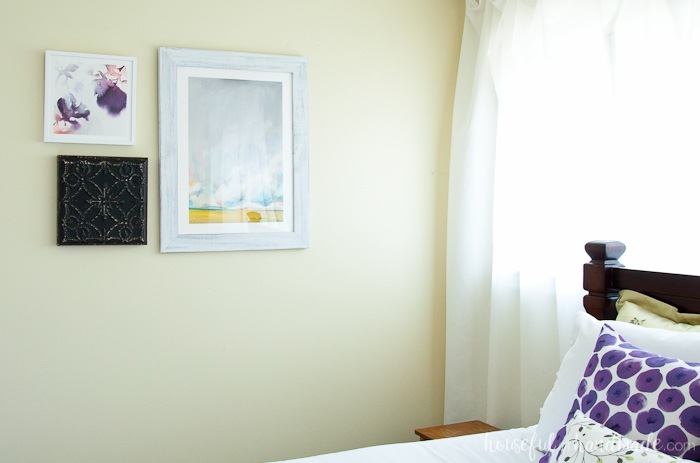 The hardest part of this entire master bedroom makeover was picking out the artwork on Minted.com. Not because it is hard to shop on their site, but because they have way too many beautiful pieces to select from! Seriously, I was on a Skype call with my mom and 3 of my sisters. I showed them a couple links of art that I was loving. Then for the next hour, we all just keep sharing links of beautiful art. I was hoping they would help me decided, but they just made it harder. In the end I chose a piece that reminds me of a serene summer day and some beautiful watercolor flowers. The art helped me figure out exactly what direction I wanted to go with my master bedroom makeover. I wanted a calm and relaxing place (unlike every space that the kids have taken over in our house of craziness). But I wanted to add a pop of color. I like to add a bit of color to each room for depth and interest. The purple in the watercolor flowers print I chose was the perfect shade to add to the sage green. 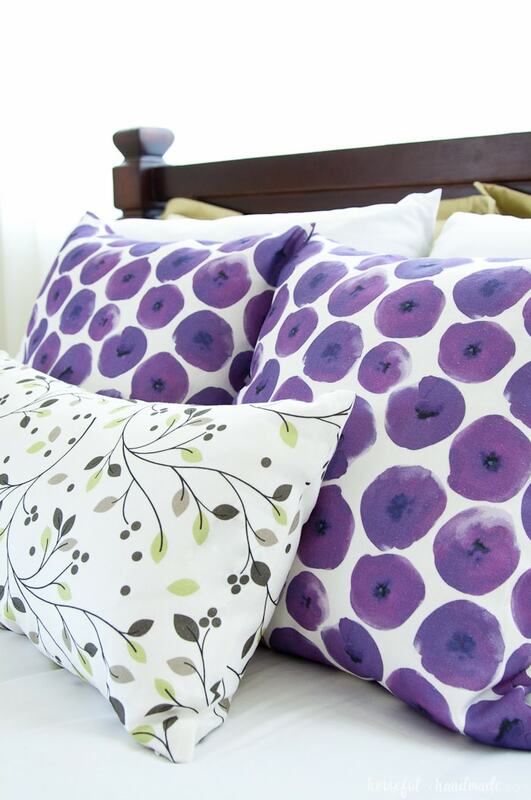 And purple is suppose to mean passion, so perfect for a master bedroom (wink, wink). 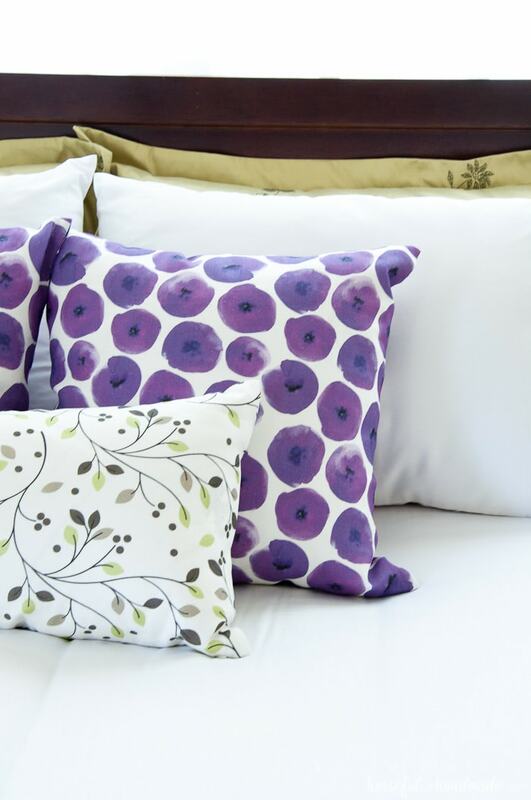 The easiest and comfiest way to add color to a bedroom is with pillows! Please tell me I am not the only person that loves beds piled high with pillows. My husband didn’t even complain when I told him I wanted to add a giant pile of pillows on our bed (not that he actually makes the bed). So I went back to Minted.com to look at their pillows. I really love that their pillow are also art. Just look at these gorgeous prints! After ordering the art and pillows, I made a plan for the rest of the room. Because it is a bedroom, curtains are a must, but I decided to only hang thin white curtains so they wouldn’t block the light. I also wanted the curtains to go to the ceiling to give the elusion that the room was larger and the ceilings were higher. I found some plain white curtains at Ikea and hung them on black plumping pipe. They cover the entire wall. Immediately our room felt bigger and brighter. However, I still loved those sage green silk curtains. And since I don’t get a lot of silk in my life (not really conducive to my mom wardrobe), I decided to upcycle the curtains! 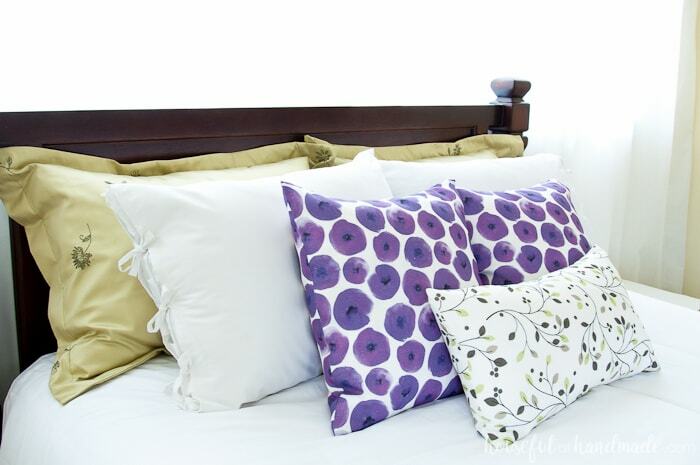 A little bit of sewing and $0 later, I had two beautiful silk pillow shams for the foundation of my pile of pillows. I never thought I would have such a chic bed. I feel like a queen sleeping with silk pillows. The other curtain panel was transformed into a roman shade for the window on our door to the backyard. 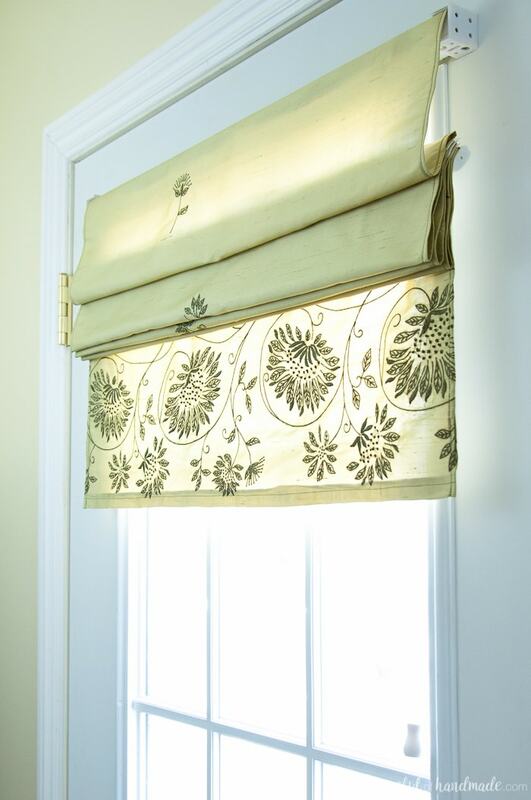 I made this roman shade out of $4 mini blinds just like I did for our dining room. So it only cost me $4 for the silk roman shade to cover a window that I am embarrassed to admit has been bare since we installed the door 8 years ago (sorry neighbors). But now all the windows in our master bedroom are properly dressed! This was also a good time to buy a new white duvet cover for our bed. 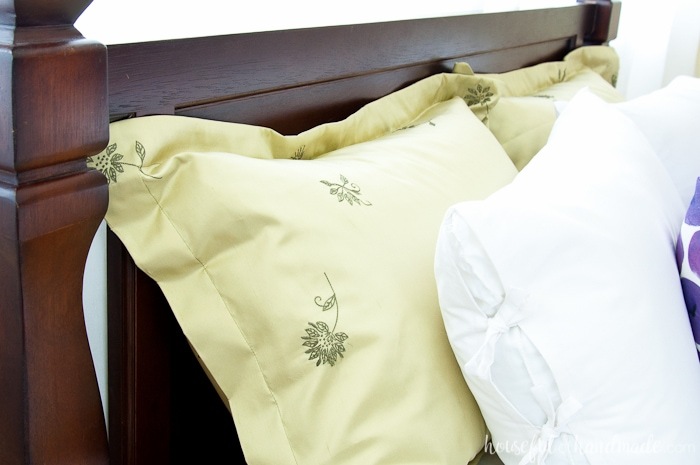 They tend to get dingy over time, especially when your dog likes to sneak on the bed when you are not home. 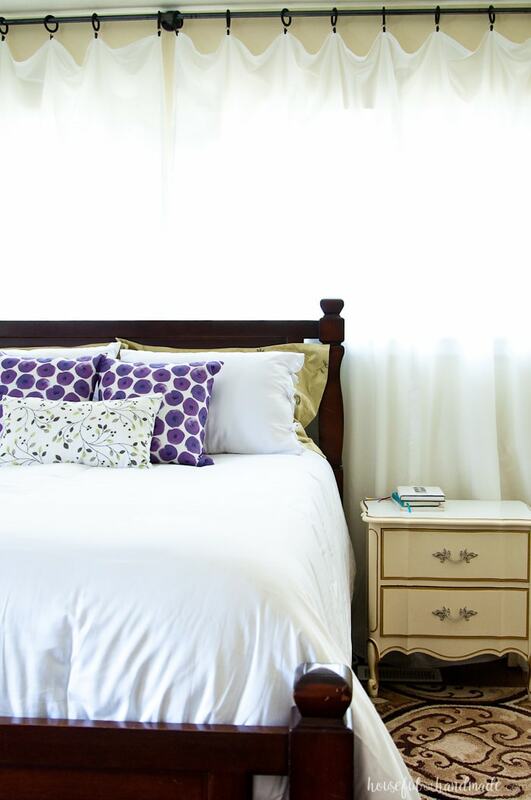 Well what do you think of our weekend Master Bedroom Makeover? It’s amazing what a few key projects in a space can do. I love that the walls are finally not bare, and neither is the bed. And now I have a place that I can relax in when the rest of the house is still in 7 stages of remodel. However, the room is still not done. I don’t know if you noticed those mismatched hand-me-down nightstands. I think I will try to build some new ones as soon as I am done in the office & craft room. Then I also need to refinish the hand-me-down dresser so it fits in better with the space (I am thinking it will become purple… yes or too much?). And lastly, I probably should install doors on our master bedroom closet. I have been putting that off for 8 years too. So lots more projects to come! But thanks to Minted.com I am loving my room right now. Now I am going to enjoy my weekend Master Bedroom makeover and maybe even sneak in a nap! 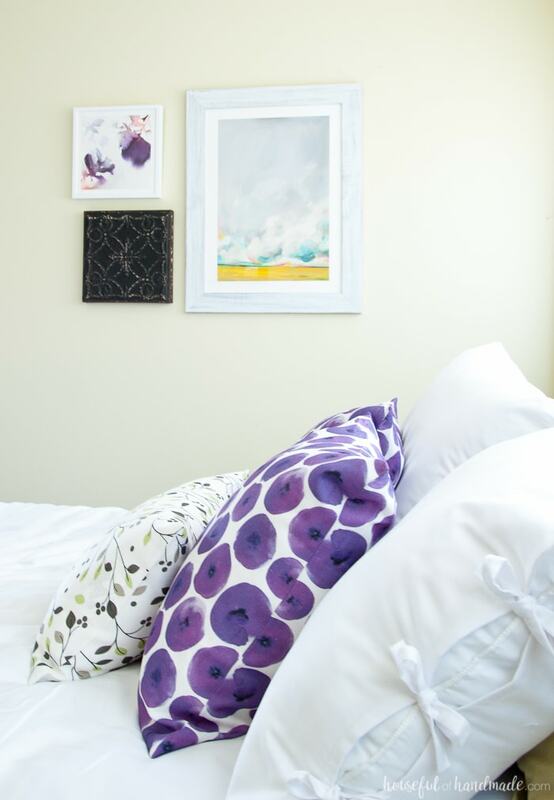 The White with the pillow pops of color make such a difference.Thank you for sharing on Merry Monday! Have a great week! Thanks Kim! I love our new retreat. Right now I am in a project holding pattern while I study and prepare for my final test of the NCIDQ exam (National Council for Interior Design Qualification). I’ve asked my husband if it’s ok if the first project I tackle after the exam is to rip up the carpet in our three season room and paint the beadboard walls. I think he agreed?! Haha! Have you done a sunroom makeover? Your bedroom looks like a wonderful retreat now. I love the artwork you picked, and the pillows, too. The purple flowers are very fun! Without seeing your dresser, I’m wondering if purple would be a good choice for it? I do love purple, tho! 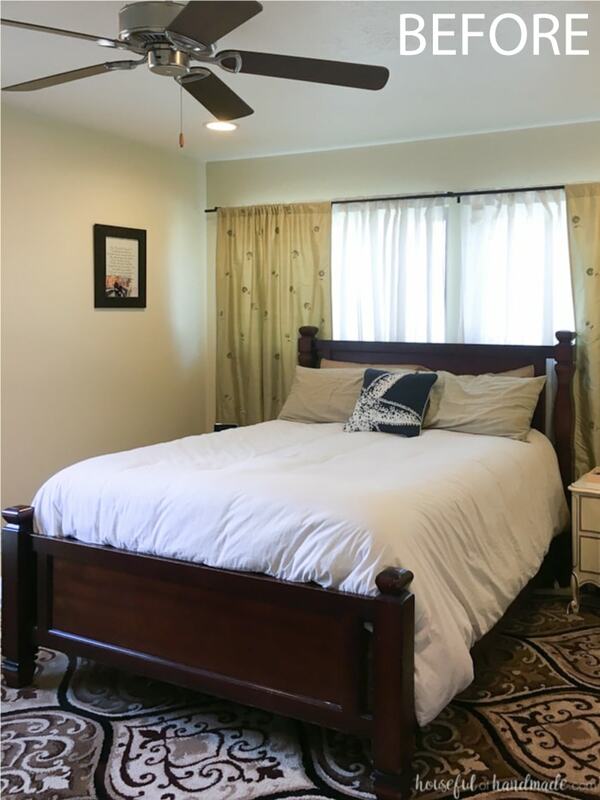 The bed is such a dark color, and a statement piece in the room. Is the dresser big or small? Decorative or plain details? Yeah, my husband hates when I jump around from project to project, but that’s how I work 🙂 Good luck on your projects! My dresser is a larger dresser with a bit of detail, but I think I want to replace it or fill in a lot of the details. The purple I want to paint is a darker plum purple. Unfortunately it will probably be awhile since we are getting ready to do some outdoor projects while the weather is good.